You’ve probably used a Cuisinart product in your kitchen or know about the brand and you’re interested in their ice cream makers. You want to know whether Cuisinart make a good ice cream maker, and even which Cuisinart ice cream maker is the best choice for you. We cover a full range of Cuisinart ice cream makers in this review and tell you what we like and don’t like about each one and also tell you which models are best for you. 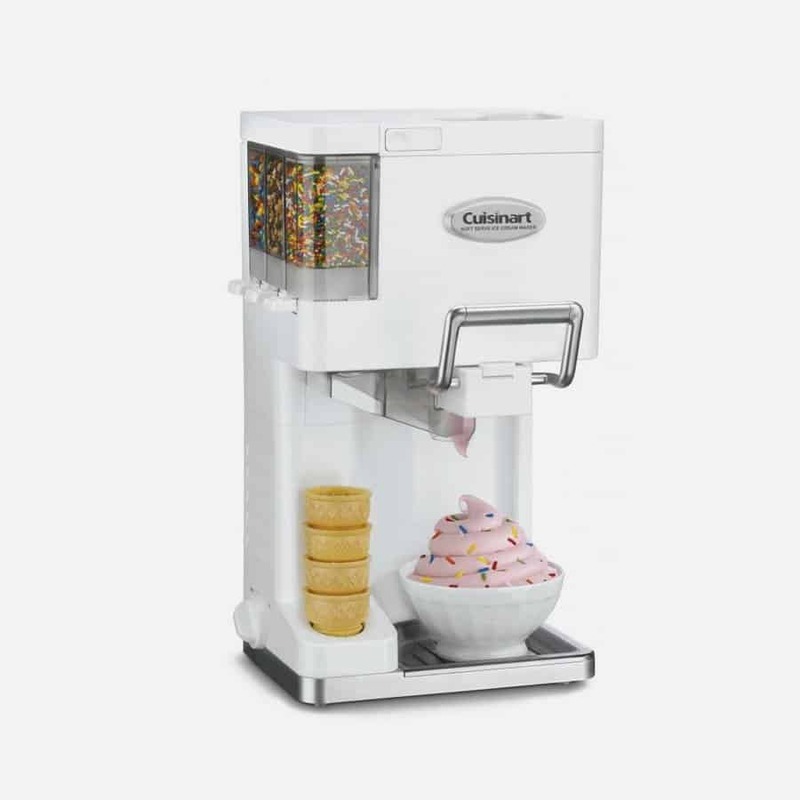 Cuisinart makes a lot of different ice cream markers, from really simple and inexpensive models to serious full-blown ice cream or gelato making machines. Use the table of contents below to skip to specific models that you might be interested in or just keep reading through the whole review so see each one and compare how similar and how different each model is. Who Is The Cuisinart ICE-30BC Best For? Who Is The Cuisinart ICE-45 Best For? Who Is The Cuisinart ICE-31 Best For? 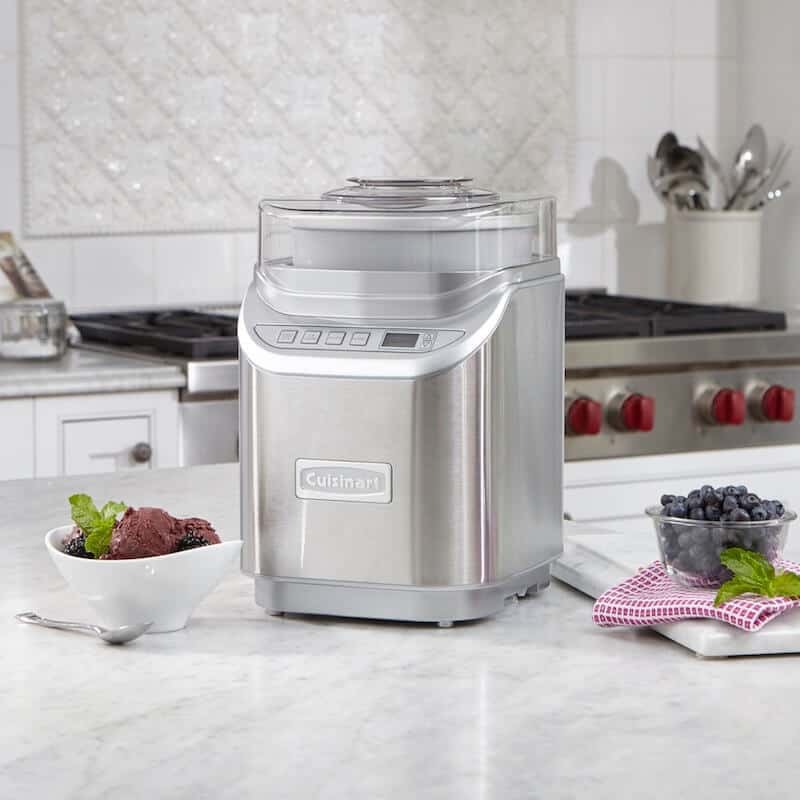 Who Is The Cuisinart ICE-100 Best For? These Cuisinart ice cream makers are shown here in order of cost or simplicity, starting with the lowest cost Cuisinart ice cream maker. We tell what is best about each model and also tell you what we think is the best Cuisinart ice cream maker of all. The ICE-21 is pretty simple to operate and one nice thing is that you can make ice cream (or sorbet, or frozen yogurt) as quickly as 20 minutes. You just put your ingredients in the mixing bowl and turn it on, it will automatically do it’s job until it’s done. Note that before you can make ice cream with this Cuisinart and all of the other Cuisinart ice cream makers reviewed here (except the ICE-100) you have to freeze the processor bowl. You have to put your freezer bowl in your freezer for between 18 and 24 hours before you use it. So, either store the freezer bowl in your refrigerator or be plan a day ahead to make your ice cream other other frozen food. For a little more information about how best to freeze see the Freezer Bowl info at the end of this review. The ICE-21 has a capacity of 1.5 quarts and weighs about 9 pounds. The ICE-21 is the lowest priced Cuisinart ice cream maker reviewed here and if you want an inexpensive ice cream maker that is pretty simple to use, the ICE-21 is a good choice. The ICE-21 comes with a standard 3-year limited warranty from Cuisinart, but some customers have been frustrated with shipping costs and other hassles when they’ve had to use it. (Read the Cuisinart Warranty section at the end of this review for more information). For that reason, you might want to buy an extended warranty that may be simpler to use if you need it. Most warranty options are pretty inexpensive so consider buying one. You can check warranty options and current pricing for the Cuisinart ICE-21 on Amazon here. The Cuisinart ICE-30BC, like most of the Cuisinart ice cream makers reviewed here, is very simple to operate and even hard to get wrong when making ice cream, yogurt or gelato. The ICE-30 also has more capacity than most of the Cuisinart ice cream makers that we review here. It has 2 quarts capacity while most of the other ice cream makers only hold 1.5 quarts. That extra capacity may make a big difference to some who just can’t get enough ice cream or other frozen treat out of the 1.5 quart capacity machines. The ICE-30 is also among the lowest priced Cuisinart ice cream makers reviewed here, so note that too. Like almost every Cuisinart ice cream maker reviewed here, you must pre-freeze the double insulated processing bowl in your freezer for up to 24 hours before you can make your batch of ice cream with the ICE-30BC. Once you’ve done the pre-freezing, however, the ICE-30 will automatically make your ice cream, sorbet or frozen yogurt as quickly as 25 minutes. The ICE-30BC is a great 2-quart capacity option at a fairly low price. If you regularly make ice cream or sorbet or frozen yogurt and want more than 1.5 quarts per batch, then the ICE-30BC is a great option. This is especially true if you realize that some of the space in every ice cream maker is taken up by mixing paddles and other parts of the machine, so that the actual capacity of your ice cream maker will be less. If you want a 2-quart Cuisinart with a few more speeds and options, then consider the ICE-60W reviewed below. 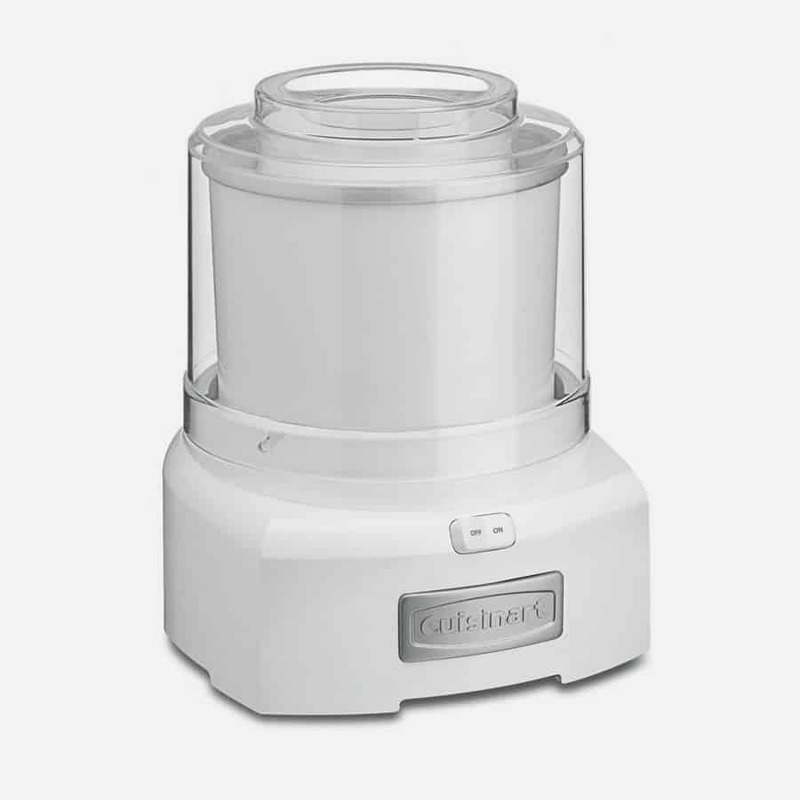 Like all Cuisinart ice cream makers, the ICE-30BC comes with a 3-year warranty that some have found difficult or at least a pain to execute because of shipping costs, so you may want to consider an extended warranty that may have free shipping and options for even longer term coverage. You can see the ICE-30BC on Amazon here with extended warranty options and current pricing. This mix-ice soft ice cream maker is different from most of the other ice cream makers reviewed here. It makes soft ice cream and then has three separate mic-in containers to sprinkle stuff like sprinkles or chocolate chips on top of your ice cream. Since you have three containers, you can add a lot of different mix combinations. You can see them in the photograph of the ICE-45, the clear window with the sprinkles inside of it divided up into three containers. Two of the containers are larger sized to allow you to add bigger ingredients like peanut butter cups. Operating these containers can sometimes be tricky and can lead to over pouring for certain sized ingredients. You’ll have to see which ingredient you use or prefer to use and test how easily it is to dispense through one of the containers to get comfortable using it. The soft serve ice cream is dispensed by pulling down the metal handle on the machine, like you would in a self-serve yogurt shop. Like most of these Cuisinart ice cream makers, before you use your ICE-45, you will have to freeze the freezer or mixing bowl for up to 24 hours. So, keep that in mind when you’re thinking about using it. The ICE-45 also has a 1.5 quart capacity like most of the Cuisinart ice cream makers reviewed here. If you like soft serve then the ICE-45 gives you a little glimpse of running your own soft serve ice cream shop. If you want a straight-forward ice cream maker though, try any of the other Cuisinart ice cream makers reviewed here. Also know that the limited warranty from Cuisinart, which is 3 years, may not give you enough protection since shipping costs to send and receive your ice cream maker for repair may not be covered. For that reason alone, but also for potentially longer term coverage, you should consider buying an extended warranty. Check extended warranty options here on Amazon with current pricing and any discounts. Like the ICE-30BC, the ICE-60W (and ICE-70) has 1/3 more gross capacity than the rest of the Cuisinart ice cream makers reviewed here. Unlike the ICE-30BC, however, the ICE-60W and ICE-70 have 3 specific modes to choose from: ICE CREAM (also used when making frozen yogurt), GELATO and SORBET, while the ICE-30BC just has one motor setting no matter what you’re making. The difference between the ICE-60W and the ICE-70 is a countdown timer in the ICE-70 that the ICE-60W does not have. The LCD countdown timer in the ICE-70 also makes it more expensive than the ICE-60W (see pricing options for both of these models below). The ICE-60W is a large capacity ice cream maker with three blending modes give you more options when you’re making ice cream, gelato or sorbet. The gelato mode spins slower than the other two modes. So, for more precision in making your favorite frozen treats and a relatively large capacity, consider either the ICE-60W or the ICE-70. In choosing between the ICE-60W and the ICE-70, consider whether you want a countdown timer that will automatically shut off the machine and how much more you want to pay for one (see links below for pricing information). This feature may be important to you if you worry that you might miss turning the machine off before the frozen treat is blended and don’t want it to keep going and potentially even damaging the motor. Also look at pricing for extended warranty options for either model since the Cuisinart limited 3-year warranty has been tough for some to work with and will likely require you to pay for shipping to the repair center. 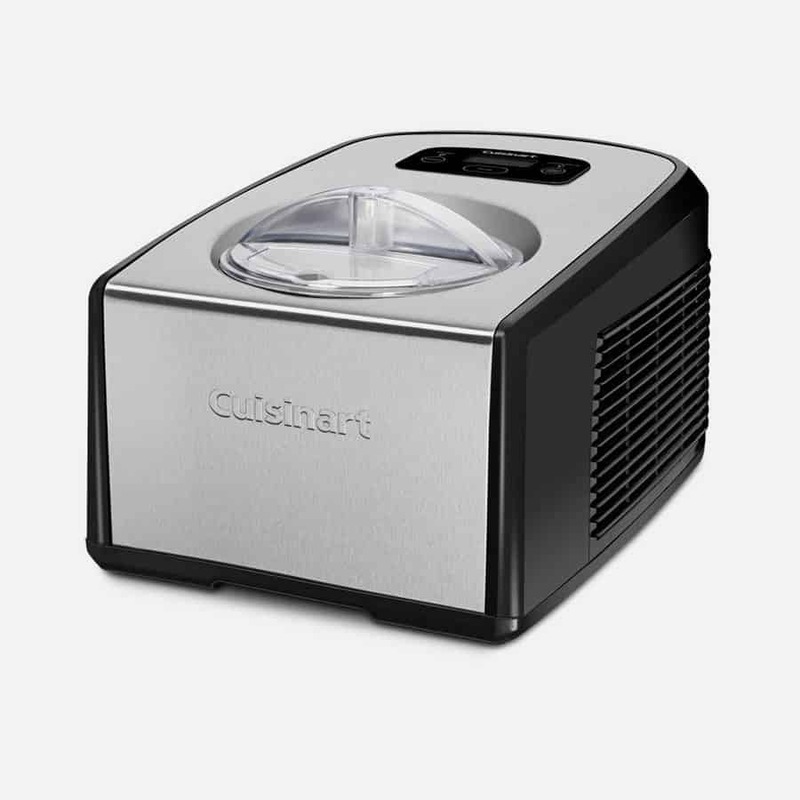 Check here for the Cuisinart ICE-60W current price and extended warranty options and here for the current price and extended warranty options for the ICE-70. This Cuisinart, the ICE-31, is different than most of the Cuisinart ice cream makers reviewed here. It is designed to mix in fresh fruit and uses a special mixing paddle for breaking down the fruit into smaller pieces. It also comes with another paddle for mixing standard ice creams and frozen yogurts. The ICE-31, like most of the Cuisinart ice cream makers reviewed here, has a capacity of 1.5 quarts. And also like all of these Cuisinarts, the ICE-31 is really simple to use. Just add your ingredients, turn it on and it will automatically make your frozen treat, as quickly as 18 minutes, but also like most of them, it doesn’t have a built in compressor. What that means is that you have to freeze the freezer bowl for up to 24 hours before you can use it. Unlike most of the Cuisinarts reviewed here, the ICE-31 has thre color options to choose from in addition to the stainless steel belt in the body of the machine: White, Berry (or Red) and Turquoise. The ICE-31 is really for those who want to blend a lot of fruit into their ice cream or frozen yogurt. In that sense it is a “mix-in” like the ICE-45 soft serve mix-in ice cream maker also reviewed here. 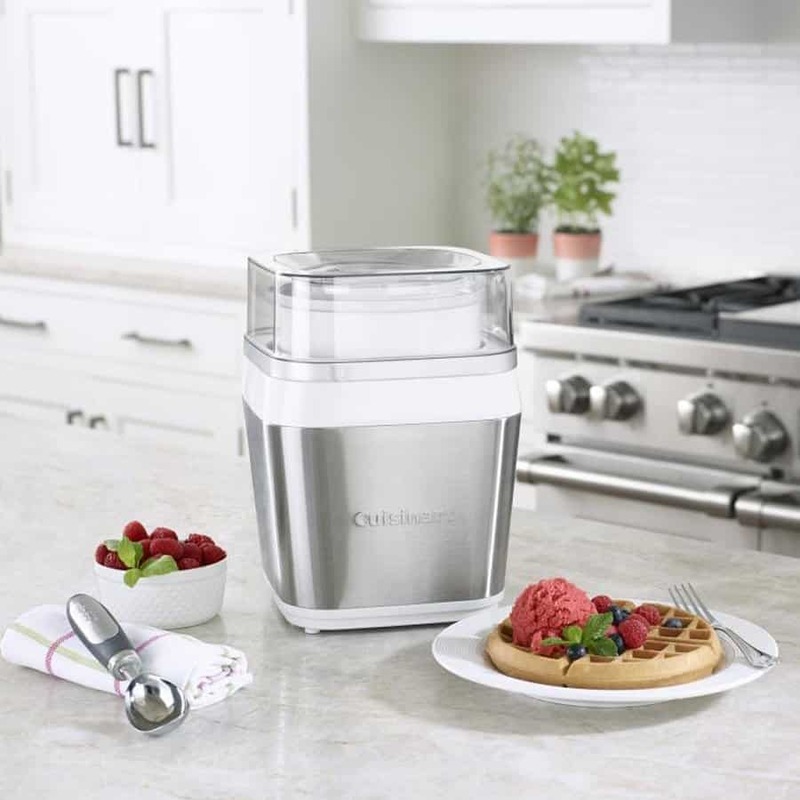 This Cuisinart has a specially designed paddle to use for breaking down fruit while blending your frozen treat and is therefore a specially designed machine for those who plan to use this machine with fruit blending. It also works for making regular ice cream or frozen yogurt, but you can also get the same functions in the ICE-21. 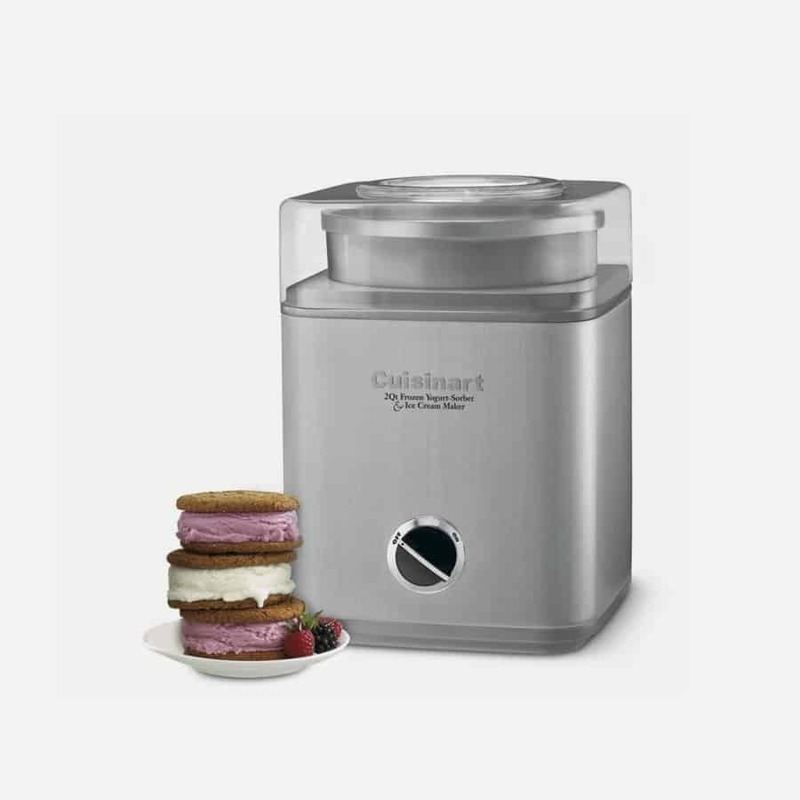 The three year warranty that comes with this Cuisinart and with the other Cuisinart ice cream makers reviewed here has been a pain for at least a few customers that have had to use it, so you might want to purchase an extended warranty. You can check extended warranty options and current pricing for the Cuisinart ICE-31 here on Amazon. The ICE-100 is a full-blown ice cream and gelato maker with built in compressor so that you don’t have to freeze your ice cream in your freezer after you mix it. The whole cycle is straightforward and is easy to execute, it only takes an hour. So, compared with the freezing time required of all of the other Cuisinart ice cream makers reviewed here, the ICE-100 is by far the fastest start to finish Cuisinart ice cream maker. It is clearly the best of the ice cream makers reviewed here but it is also the most expensive. It comes with two paddles, one for making gelatto and one for marking ice cream. Just add your ingredients and let the machine run automatically for 60 minutes until your ice cream or gelato is ready. The ICE-100 has a capacity of 1.5 quarts. The ICE-100 is a high quality ice cream (and gelato) maker that makes your ice cream about as easily as possible. It is simple to operate and because it comes with it’s own compressor, you don’t have to separately freeze your ingredients. This machine is best for those who just want to add their ingredients and let the machine do the work. It’s basically a professional quality machine that works easily. So, if you value the ease of operation and don’t mind paying more for it, then the ICE-100 is a good choice. If you want a less expensive and more basic ice cream maker, just take a look at some of the other Cuisinart models reviewed here. The ICE-100 comes with a three year warranty from Cuisinart, so you may not need an extended warranty unless you buy a four year warranty for an extra year of protection. You can check warranty options, any discounts and latest pricing for the Cuisinart ICE-100 on Amazon here. Almost all of the Cuisinart ice cream makers reviewed here, except the ICE-100, require that you have to freeze the freezer bowl, the bowl that the ice cream is made in for up to 24 hours before you can use it. So, even though most of these ice cream makers can make your frozen treat recipe in 18 or 20 minutes, you’re going to have to plan ahead before you can actually make it. That is, unless you store the freezer bowl in your freezer or you may also buy another freezer bowl available with other accessories when you buy your ice cream maker. With two bowls, you can even keep two bowls in your freezer and make a big batch of ice cream, frozen yogurt or gelato whenever you want to. Also, know that your freezer bowl has liquid inside it and when the bowl is completely frozen the liquid will be too. So, one way to tell whether your freezer bowl is ready to use, or frozen enough is to see if you hear any liquid still unfrozen when you shake your freezer bowl. The freezer bowl is also double-walled to help speed the freezing process (it is also why you don’t have to use ice to make ice cream with these Cuisinart ice cream makers, the freezer bowl becomes cold enough to replace the need for ice). Be sure to place your freezer bowl upright and on an even surface. You don’t want the liquid inside to freeze unevenly or at an angle, then the machine will wobble around when it’s churning. Whether your freezer bowl is 1.5 quarts or 2 quarts, know that space is taken up by the mixing paddles and other elements of each freezer bowl so that the actual capacity of the freezer bowl is less. Also, you want to make sure that you don’t over-fill the freezer bowls in these ice cream makers, or they’ll probably spill during the mixing or churning process, making a big mess. Better to only fill to a little less than maximum capacity to avoid spilling. If you’d like to see the manuals for each of the Cuisinart ice cream makers that we reviewed here, just scroll down to each model and click on the link. The manuals may help you to better understand how each machine works and also will help you if you already own a Cuisinart ice cream maker but may have lost your own manual. The standard warranty that is included with you purchase of each Cuisinart ice cream maker is a limited 3-year warranty. The warranty doesn’t cover accidental damage, just product defects. You will probably also be required to pay shipping to send your broken machine back to Cuisinart (unless you’re in California state laws may provide other options). 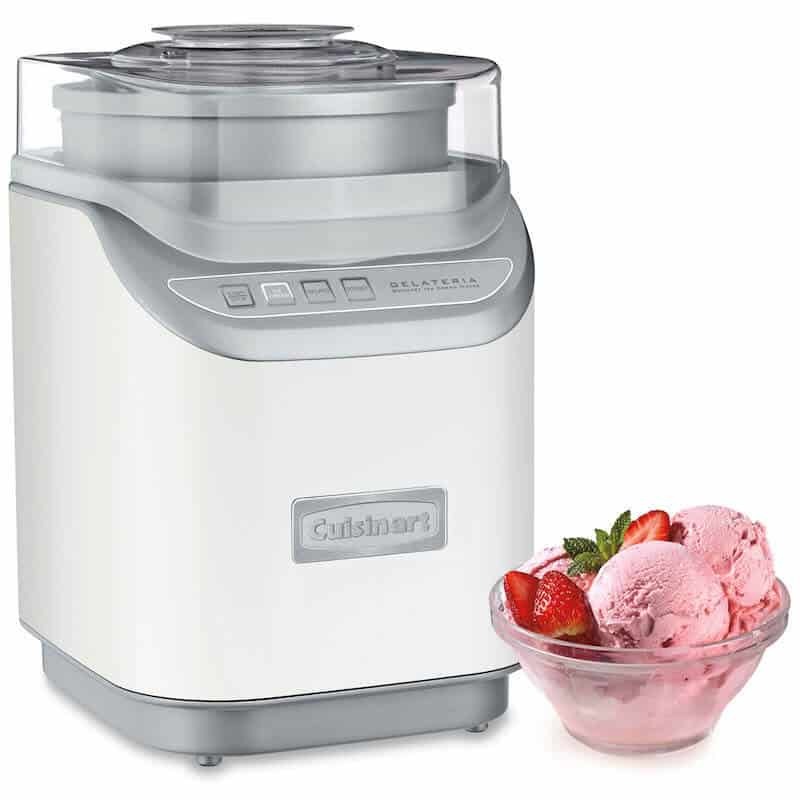 Because of potential hassles and additional costs, we recommend in our product reviews of each ice cream maker that you consider buying an extended warranty when you buy one of these Cuisinart ice cream makers. An extended warranty may give you an easier return process, options for even longer term protection and may even provide more protection for things like accidental damage, check what the extended warranty provides before you buy it. But even so, most of the extended warranty are inexpensive and worth buying if you can get a 4-year term, for instance, even if the warranty itself only provides the same product protection that the standard Cuisinart warranty provides. Another advantage of many of these extended warranties is that you may not incur any extra costs with them for shipping or something else. Check before you buy, but if Cuisinart charges at least $10 for shipping and the extended warranty doesn’t, then the extended warranty may be worth buying for that cost savings alone. If you’re interested in other reviews, check out our reviews of Bunn Coffee Makers here and for blender reviews you have several options (best blenders here, Vitamix vs Ninja here and several Ninja blenders here). For best countertop ovens, read this review here and a comprehensive review of the Wolf Gourmet Countertop Oven here.